Have people ever told you, “You should write a book”? Here’s your chance! 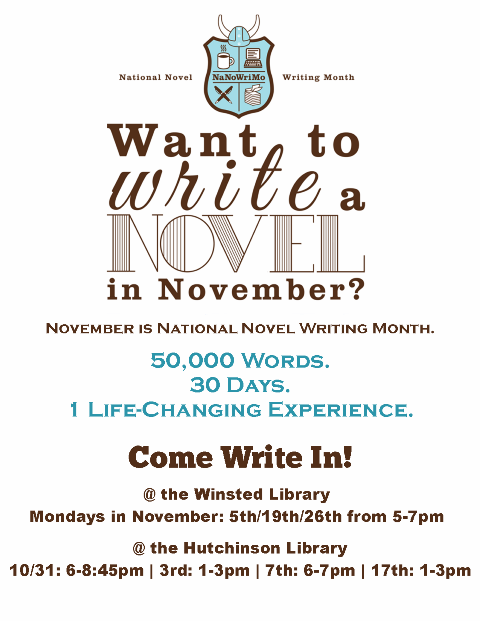 Join millions of other people this month for National Novel Writing Month (NaNoWriMo) as they put pen to paper in the attempt to write a 50,000-word novel by 11:59 PM on November 30. The Winsted and Hutchinson Libraries will be hosting writing nights throughout the month to help you meet your goal, and who knows? Your book might even end up on our shelves someday! Are you ready to Come Write In? *Please bring ear plugs or headphones if you need quiet to work. 5:30-6pm: Final writing session and update to NaNoWriMo. 6-6:45pm: Writers can read their book’s hook and/or favorite passage to the group. To register or for more information, please call the Winsted Library at 320-485-3909, or stop in during normal library hours.